Ermenegildo Zegna tie featuring large floral motif. EXCLUSIVELY AT NEIMAN MARCUS Ermenegildo Zegna tie featuring box-on-jacquard. Approx. 57"L; 3.5" at widest. Silk; dry clean. Made in Italy. 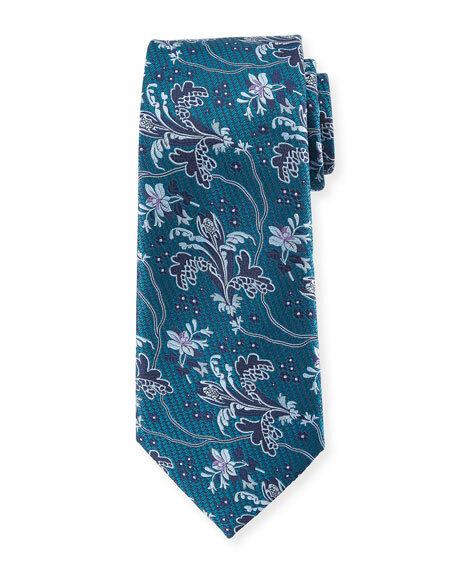 Ermenegildo Zegna tie in exploded floral pattern with tonal pines. Silk. Made in Italy. Ermenegildo Zegna tie in medallions motif. Greater than 3" at widest. Silk; dry clean. Made in Italy. EXCLUSIVELY AT NEIMAN MARCUS Ermenegildo Zegna tie in paisley pines motif. Approx. 3" at widest. Silk; dry clean. Made in Italy.